Since we launched the Google Tasks API we have received a warm welcome from the developer community on the public forum, and a lot of question on how to make it work with OAuth 2.0 on Android. Let's see how this can be done. Android has its own native authorization flow and its own way of handling Google accounts as you can register them on your device. 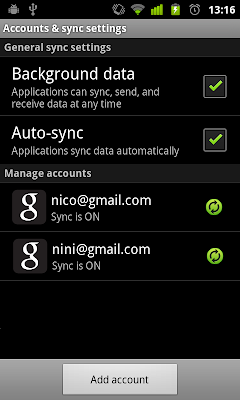 Since Android 2.0, the AccountManager manages the accounts that you have registered - the ones that are listed under Settings > Accounts & sync. Specifically, it handles the authorization flow and can generate authorization tokens that are required to access data using APIs. If more than one Google accounts are available on the Android device you should prompt the user for the account he wishes to use through a dialog. // a token is available. During the AccountManager.getAuthToken() call the AccountManager will check if your application has been authorized to access the Tasks API. If your application has not yet been authorized the user will be presented with an authorization dialog so that they can Allow or Deny your application to use the Tasks API on their account. At this point you should have a fully setup Tasks API service Object which you can use to query the API as per the Tasks API developer’s Guide. If you would like to get more tips and learn more about getting the Google Tasks API and OAuth 2.0 working on Android please have a look at our newly published article. Also we recently added a new sample to the Google APIs Client Library for Java sample repository to help you getting started with the Tasks API and OAuth 2.0 on Android.